A musty smell floats in the air as I flip the pages inside the maroon covers of my high school yearbook. Cathy sits on my left, Julie on my right on my living room couch, all three of us reminiscing about people and events more than forty years ago in a small, Midwest town. This year, everyone in the Class of ’71 (the three of us included) turned sixty; last winter we three cooked up the plan to celebrate this milestone in July at my home on Lopez Island, WA. Living as I do nearly two thousand miles from the home of my youth in Southern Illinois, and with no family members still there to pull me back, I’ve returned just a handful of times since moving west in 1981. 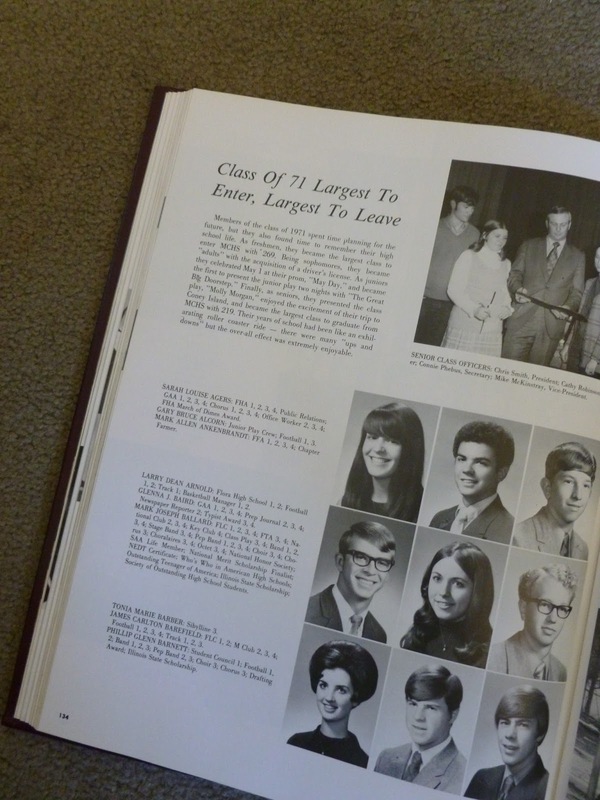 The two women poring over the yearbook with me are the only people I still have regular contact with who knew me and my parents well during my teen years. From our first meeting, we three shared the bond of being only children and formed a kind of sisterhood. Now, we scrutinize pictures of the concert band, in which we all played the flute; the Top Hatters precision dance team with us kicking our black, fishnet-stockinged legs high; the Foreign Language Club (I studied French; Julie and Cathy took Spanish); and the 219 portrait photos of each of us in the graduating class. 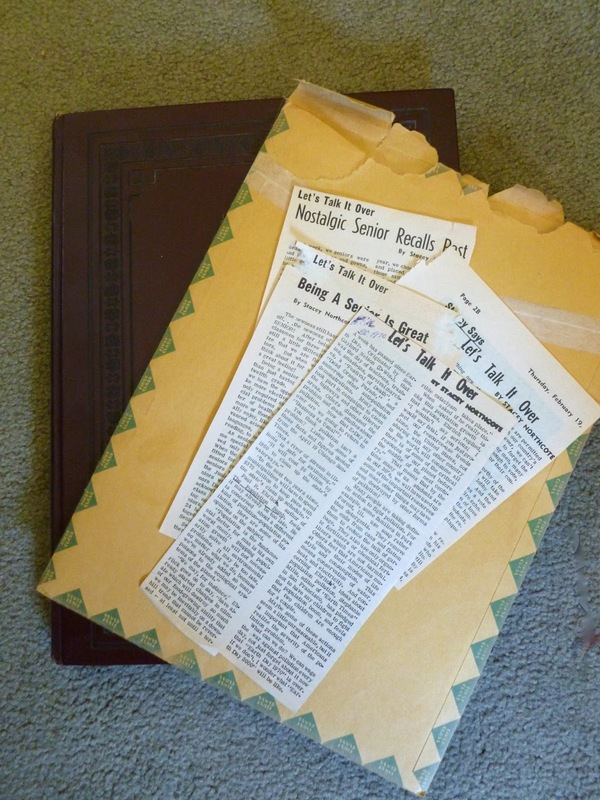 Tucked inside a manila envelope in my yearbook are four yellowed strips of newsprint, clippings of “Let’s Talk It Over,” the column I wrote for the school newspaper. The byline lists my former name (Stacey Northcote—that’s a story for another time). A couple columns reflect the Midwest values I grew up with—patriotism, school spirit, community. Not a river or stream in Illinois is safe for swimming. It will cost $6 billion by 1980 to clean up the state’s waterways. It may be too late, no matter what we do, because we’ve already added so many poisons to the ecological systems of the planet. We may, for instance, have already started changes in climate which will destroy so much of our food-growing ability that we may be inevitably on a downhill trend that cannot be reversed—at least not until a terrible cataclysm takes place. I’m surprised that as a high school junior I used (at least sometimes) my writing to raise awareness about social issues. Most of all, I’m surprised to discover that writing really has been a throughline for me. Russian actor and theater director Constantin Stanislavski coined the term in the 1930s to help actors explore the central impulse or desire that connects all of a character’s individual motivations and objectives together. The term also is used to describe a theme or thread that runs through the plot of a film or other dramatic or literary work. As my two friends and I continue to turn the pages, I come across a photo of me with other members of Quill and Scroll (international honorary society for high school journalists). I remember the profile I wrote for the school newspaper of a classmate who collected antiques (a foreshadowing of my book, Hands at Work?). Memories of the newspaper I helped produce at Vincennes University journalism camp the summer before my senior year re-surface, too. More evidence of this thread of writing running through my life. Throughlines. I suspect we all have one, whether we know it or not. For so many years I believed that nursing was the single thread that connected all of my actions, but perhaps, unlike novels and plays, we can have more than one. Although I’ve identified myself as a writer for only the past fifteen years, these musty newspaper clippings, the yellowing yearbook pages, and high school chums remind me that the writing throughline reaches back to a much earlier time in my life. What is the throughline in your life? Is there more than one thread that connects all of your drives and aspirations?